While at Hope House, Hanh felt safe, secure and accepted. She made good friends, improved her grades in school, and began to dream again. She also learned about Love; and that Love continues to heal her. Hanh’s mother died about a year ago, which has been an adjustment. But we found a believing foster home for Hanh, and she has continued to blossom there. Hanh is now in the 12th grade and dreams of going to university to become a teacher. Through your generosity, Orphan Voice will help her realize her dream to become a teacher. In this video (below), Hanh shares with an Orphan Voice counselor and talks about the changes in her life since coming into our care. Because of your faithful prayers and support, Hanh has risen above her horrid past! Doctors tell Hanh that, because of her abuse, she won’t have children. But we believe otherwise. Will you lift Hanh to the One who alone decides? And thank Him for the beautiful testimony of restoration in her life. To help Hanh and other girls like her, Donate Here. Or mail your support to Orphan Voice, P.O. Box 910410, Lexington, Kentucky 40591. It was understandable that the kids were undisciplined. They had never been in school before! Pastors Bob and Darlene McCoy, and their deaf son, Bobby recently visited New Beginnings. Bobby is 19, is overcoming his disabilities, and is prospering in life — the very role model we want to hold up to the New Beginnings children. Bobby spoke to and greatly encouraged the students during his family’s visit. Needless to say, that statement make my day. New Beginnings children are learning sign language, reading, writing, math and character development because of the generosity and love of you, our partners. Thank you. New Beginnings is part of Orphan Voice’s commitment to the special needs community. We need your help to continue that outreach. Praise the Lord for all He is doing through YOU to give them a future and a Hope! To support New Beginnings, donate here. You never know what you’ll encounter on an Orphan Voice friendship team! Oh, there’ll be all the sights and sounds of Vietnam, and plenty of ministry opportunities. You’ll be in a safe environment with folks who love the Lord, and who speak English! But you may experience even more than you expect! Here, volunteers from two different continents have a little fun embracing the stereotypes of each other’s cultures. Catherine is from Kentucky, and Olivia is from New Zealand. In this spoof video, Olivia teases Catherine about “drive your tractor to school day,” fried chicken, and beans and cornbread. Catherine, pretending to be from New Zealand, complains that no one knows where that is, and that people ask her if she lives in the “bush.” They copy her accent poorly, and she quote “God save the Queen!” See the video below – all in good fun, of course! To learn more about serving the Lord on an Orphan Voice friendship team, email maria.lester@orphanvoice.org. But beware. The experience will change your heart, and, perhaps, your world view! The Vietnamese community in Phnom Penh, Cambodia lives along the banks of the Mekong River which runs through the city. There, they are mistreated. As hard as it is to say, the families largely depend on fishing, working in sweat-shop garment factories and prostitution in order to live. To ease the economic pressure, at times, parents push their young daughters toward a life of prostitution. A mother had two children – a teenage daughter and a 2 year old son. She had been reduced to begging for her children’s food. Still she couldn’t feed them. One day, a man to whom she was in debt offered her lots of money for her daughter to join a brothel. Unwilling for this to happen, but pressured by her circumstances, she finally asked her daughter to do it. In the end, the mother felt enough pressure to say: “If you don’t join the brothel, I’ll be forced to abandon your brother. If I place him in this boat and set it free on the river, others will find him and care for him. He won’t starve.” To save her brother, the sister agreed. The Orphan Voice team was in Phnom Penh to visit and strengthen a school run by our Vietnamese friends for vulnerable Vietnamese children living there. At the school, the children get food, the basics of reading, writing and arithmetic. Needless to say, they are protected from sexual abuse. We are assisting the school in their work. These children are safe! Hear their beautiful songs! Orphan Voice reaches out to “the least of these” in vulnerable places in Southeast Asia. To join us in protecting “the least of these,” invest your gift here. Thank you. Thanks to you, Orphan Voice partners, we have now screened, trained and given out nearly 400 PET (Personal Energy Transportation) carts! That’s two 40-foot ocean-transported containers of PET carts! Each cart changes a life. Increased mobility is liberating. It also allows for increased income for the disabled. How? Many PET cart recipients sell items on the street for a living. Formerly, many of them dragged themselves or hobbled to their favorite street corner where they sold to passersby. But, as you can imagine, the “best corner” changes throughout the day. Now, with their PET carts, the disabled can more easily move “selling locations” to where the largest crowds of people are at different times of day. More people, more sales. More sales, more income! Click the picture to see them go! This is what you do! You liberate and uplift people. Thank you. 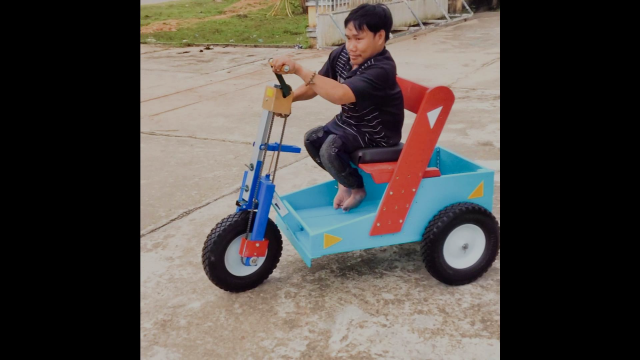 Orphan Voice works to bless the special needs community at the Phu Ninh Therapy Center, the New Beginnings School for the Deaf, in cleft lip/palate operations and PET cart distribution. It’s expensive to do so. To support Orphan Voice in this special work, please donate here.